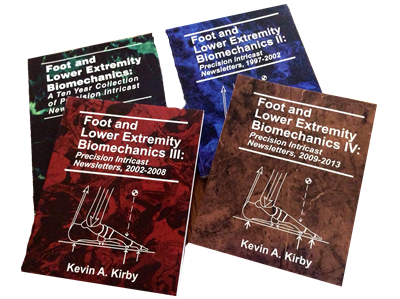 Books: These books are collections of the 317 monthly newsletters that Dr. Kirby has written over the past 27 years for the podiatry profession on foot and lower extremity biomechanics, foot orthotic therapy and sports injuries to the foot and lower extremity. Dr. Kirby's books have been sold in over 9 countries and the first three books have been translated into Spanish language editions. Television - FOX 40 NEWS: Dr. Kirby is interviewed for local TV news stories on shoes. Running Footstrike: Rearfoot, Midfoot or Forefoot, Which is Best? Published Articles/Papers: These are some of the articles that Dr. Kirby has written over the past 28 years on sports injuries, sports shoes, foot and lower extremity biomechanics, and foot surgery for the popular media and the podiatry profession. Podiatry Today -How Long Will the Podiatric Myths of the Midtarsal Joint Survive? Podiatry Today - Can foot orthoses have an impact for knee osteoarthritis? Podiatry Today, 28(10):50-60 , 2015. Podiatry Today - Is easier necessarily better with the advent of advanced technology? Podiatry Today, 28 (12):66, 2015. Podiatry Today - Should you become a skeptical podiatrist? Podiatry Today, 29(4):66, 2016. Podiatry Today - Understanding ten key biomechanical functions of the plantar fascia. Podiatry Today, 29(7):62-71, 2016. Podiatry Today - Why using proper terminology can enrich the future of the podiatric profession. Podiatry Today, 29(8): 74, 2016. Podiatry Management Magazine - How do foot orthoses work? Podiatry Management, 35(9):137-142, 2016. Podiatry Today - Plantar intrinsics: Important or useless muscles of the foot? Podiatry Today, 29(12):66, 2017. Podiatry Today - Has Tissue Stress Theory Supplanted Root Theory? Podiatry Today - Can Foot Orthoses Have an Impact for Knee Osteoarthritis? Podiatry Today - After 30 Years, Has Podiatry Changed For The Better? Podiatry Today - What is a "Normal" Foot? Podiatry Today - Is It Unethical To Prescribe Orthoses For Children With Asymptomatic Flatfoot Deformity? Podiatry Today - Should Podiatrists Think More Like Engineers? Podiatry Today - Podiatry's Future: Biomechanics Versus Surgery Or Biomechanics With Surgery? Podiatry Today - Is The Grass Always Greener On The Other Side Of The Fence? Podiatry Today - Is Barefoot Running A Growing Trend Or A Passing Fad? Podiatry Today - Have You Walked A Mile In Your Patients' Shoes? Podiatry Today - Podiatry Seminar Content: Science Or Infomercials? Podiatry Today - Are Root Biomechanics Dying? Podiatry Today - Will Physical Therapists Be Teaching Us Biomechanics In 2030? Podiatry Today - Is Manual Examination Of The Foot A Dying Art? Podiatry Today - Barefoot Versus Shod Running: Which Is Best?